Viera Connect is Panasonic's online suite and it sees a significant expansion in 2013/2014. In addition to the standard apps like Netflix, Hulu, Facebook and Twitter Panasonic has partnered with social media network MySpace and its thousands of licensed music artists for MySpace TV, a new feature that is exclusive to Panasonic televisions. The Apps selection in the Viera Connect Market has lots of choices, but how valuable are they? There is a pinging noise every time you select and App which gets old fast. Some new additions to the premium Apps are WSJ Live, Vimeo, Vudu HD movies, SnagFilms, Bigflix VOD, and Daily Motion (videos). Most of the Apps have a price ($4.99) and some are even after a monthly fee (.99 a month). Though some of the Apps are free to download, there is more than likely some later fee associated. For instance within the 3 Apps included in the Health and Fitness section, all are connected to a device that must be purchased such as a BodyMedia FIT Armband - a Bluetooth enabled device that tracks calories. 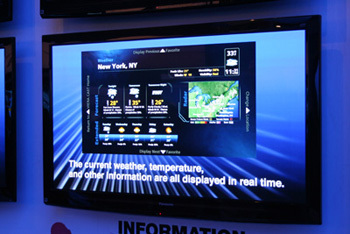 One of the advantages and innovations for Panasonic for 2013 was to integrate the Apps portion of the TV to the cloud, thus speeding search, load times, and run times. Though the free Apps selection is extremely weak on the Panasonic Smart TVs, the speed of load times through the cloud trumps all other manufacturers in the access speed category. One of Viera Connect's biggest advantage compared to some of the competition is the excellent connection through wifi. This is especially important for the movie Apps. There is no free sample 3D material that we could access through the Apps. MLS Match Day – Major League Soccer highlights from previous games and live games if you tune it at the right time. Good clarity from the ST60. Rating: 5 out of 5. This is what Apps should be like and its free. Holdem Connect (poker): This Texas Holdem style poker game (by kitmaker) is free to download but, "please note that the game allows users to purchase chips using a Credit Card." You get $2000 in chips for free. When I played, there were only 3 players and the other two players folded every hand before the turn, so were obviously not real. The mechanics of the game worked fine, though it gives a set time to make up your mind. But, there was really no game to it since the other two players folded every game. I suppose it's not the fault of Panasonic though if there are no other players in the game. Rating: 2.5 out of 5. Break Comedy: Short video clips of not-so- funny scenes, pool trick shots, sports snafus or short videos, videos of pranks, movie trailers, and game trailers. Some stuff is amusing, but I would not call it that funny or worthwhile. 2.5 out of 5 rating. Wealth TV: is free to download but then costs .99 cents per month, is a news channel reporting on financial markets and all things regarding wealth. Rating 2 out of 5. Snag Films: "The best Indie Movies on Demand." There are some free documentaries as well. I viewed one about North Korea which was of poor quality but interesting. Rating 3 out of 5. Other Premium Apps: MLB.TV, NBA Game Time, NHL Game, Fox Sports. A limited amount of content from these Apps is free and then you can upgrade from there. Overall it seems that Panasonic is not really into providing much Apps value unless you are paying for it. The company obviously wants the Viera Connect market to be a profit center for them. Owners of the 60ZT60 have the ability to transfer photos and videos from their Apple or Android devices directly to the large screen with a simple swipe, and then transfer them back to their smart device the same way. Tired of brother or sister's home screen settings? Not to worry. With the ZT60 everyone in the household can set their own Home Screen up to have easy quick access to the programming they access most. The Apps selection in Viera Connect has lots of choices, but how valuable are they? The TV makes a bell ding noise every time you select an App. Some new additions to the premium Apps are WSJ Live, Vimeo, Vudu HD movies, SnagFilms, Bigflix VOD, and Daily Motion (videos). Most of the Apps have a price and some are even after a monthly fee. Though the Apps are free to download, there is more than likely some later fee associated. For instance within the 3 Apps included in the Health and Fitness section, all are connected to a device that must by purchased such as a BodyMedia FIT Armband, a Bluetooth enabled device that tracks calories. One of the advantages and innovations for Panasonic for 2012 was to integrate the Apps portion of the TV to the cloud, thus speeding search, load times, and run times.This is especially important for the movie Apps. There is no free sample 3D material that we could access through the Apps. Some of the free Apps included in the Viera Connect Market include Facebook. Break Comedy: Short video clips of not-so- funny scenes, pool trick shots, sports snafus or short videos, videos of pranks, movie trailers, and game trailers. Some stuff is amusing, but I would not call it that funny or worthwhile. 2.5/5 rating. Wealth TV: is free to download but then costs .99 cents per month, is a news channel reporting on financial markets and all things regarding wealth. Snag Films: "The best Indie Movies on Demand." There are some free documentaries as well. I viewed one about North Korea which was of poor quality but interesting. 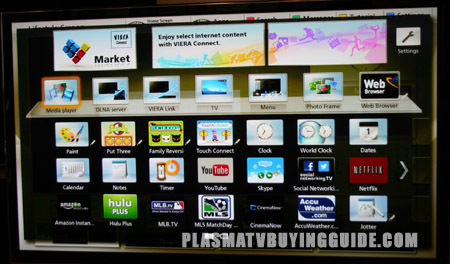 Panasonic introduced its VIERA Connect IPTV system to the world at the CES 2011 show. Building off of its VIERA Cast IPTV cloud system, Panasonic has a more robust platform. They also improved channel offerings on VIERA Connect from just a few months ago, partnering with many more major content providers to create a well-rounded set of channels. Apps like Netflix, Hulu Plus, CinemaNow, NBA Gametime, MLB.tv., Amazon on Demand, NHL, You Tube and more are now part of the offering. Panasonic VIERA Connect showed off its new channel partner, Skype, by showcasing live video conferencing in a dedicated area on the show floor. Panasonic is making its platform available to content developers, allowing them to create apps for VIERA Connect. We imagine that monthly additional games will be approved and added to the channel availability with no need for HDTV hardware updates. VIERA Connect is also targeting the interactive gaming and social networking markets, adding games like Asphalt 5, facebook and twitter to its channel mix. A section of Panasonic's expansive booth presented several racing games, some in 3D, which are visual powerful, especially on Panasonic's plasma 3D tvs. Several game pads are already available for VIERA Connect. And, fitness buffs can use VIERA Connect to do things like use an elliptical while running the streets of Paris or cycling a roadway in Hawaii. The VIERA Connect system itself is well-designed and organized and easy to use. We counted 50 major channels already available on the system. VIERA Connect will be available on Panasonic 2011 HDTVs and Blu-ray players. 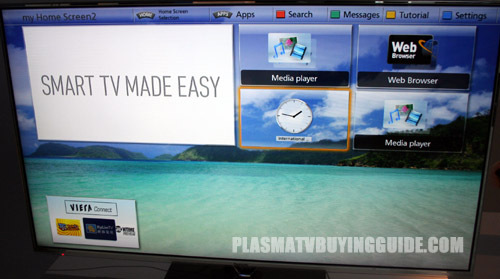 In partnership with Panasonic's VIERA tablet, users can view programming on both the HDTV display and the tablet (See our review of VIERA Tablet), which is another distinguishing feature solely in the hands of Panasonic. We anticipate fast followers to the competition. Internet TV Apps for Flat Screen TVs; Which HDTV Manufacturer has the best Internet Connectivity Features?